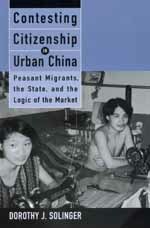 Post-Mao market reforms in China have led to a massive migration of rural peasants toward the cities. Officially denied residency in the cities, the over 80 million members of this "floating population" provide labor for the economic boom in urban areas but are largely denied government benefits that city residents receive. In an incisive and original study that goes against the grain of much of the current discussion on citizenship, Dorothy J. Solinger challenges the notion that markets necessarily promote rights and legal equality in any direct or linear fashion. Dorothy J. Solinger is Professor of Politics and Society at the University of California, Irvine. Her most recent books are From Lathes to Looms: China's Industrial Policy in Comparative Perspective, 1979-1984 (1991) and China's Transition from Socialism: Statist Legacies and Market Reforms (1993).